Bravo, bravo, BRAVO! The food and drink producers who won gold stars in the Guild of Fine Food Great Taste Awards 2014 have just been announced. And sweet and savoury food and drink products made with damsons have won several of these precious gold stars. 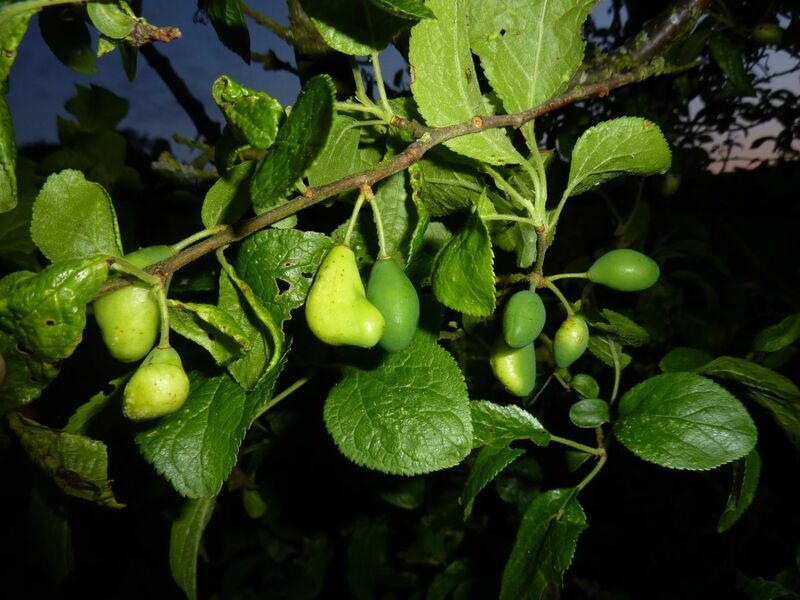 There’s an entry from Ireland, namely, WIld Food Mary’s Damson Vodka. There’s a damson jam with the stones left in (a minimally processed jam, perhaps, and one with the hint of almond from the damson stone … I’m guessing). There’s a ‘Damson Port Liqueur’, a new category to me that sounds deliciously rich. There’s a damson vinegar, one of the finest fruit vinegars you can make and taste, and one that that can easily square up to the finest balsamics from Modena. Then there’s ‘Damson Daize’, a non-alcoholic drink, now an award-winning drink, made by one of our very own Shropshire-based damsonistas, Tish Dockerty, from Appleteme. Well done, Tish! You’ve done the Shropshire Prune damson proud. Here is a list of the damson winners, along with a link to their website (if available). Congratulations everyone. Let’s hope your awards bring in excellent sales and well-deserved recognition. What is “Pocket Plum” / “Bent Banana Disease”? Its Latin name is Taphrina pruni (“taphre” is Greek for trench or ditch). This disease is fatal to damson fruits and so can seriously reduce your damson yield. It can be summed up in two words: grotesque deformity. In ten years of growing damsons I’ve come across the occasional pocket plum-blighted damson. But this year, 2014, has been the worst ever. 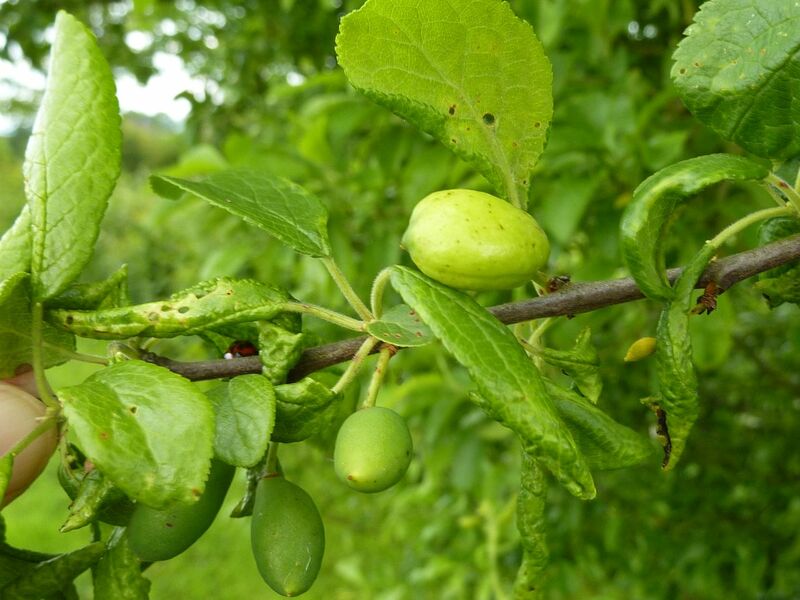 In my patch on the Herefordshire-Shropshire border, every damson tree in my orchard and in the hedges in my meadow was infected to some extent. I estimate I’ve lost maybe as much as a fifth of my crop. That’s a lot of damsons to lose. 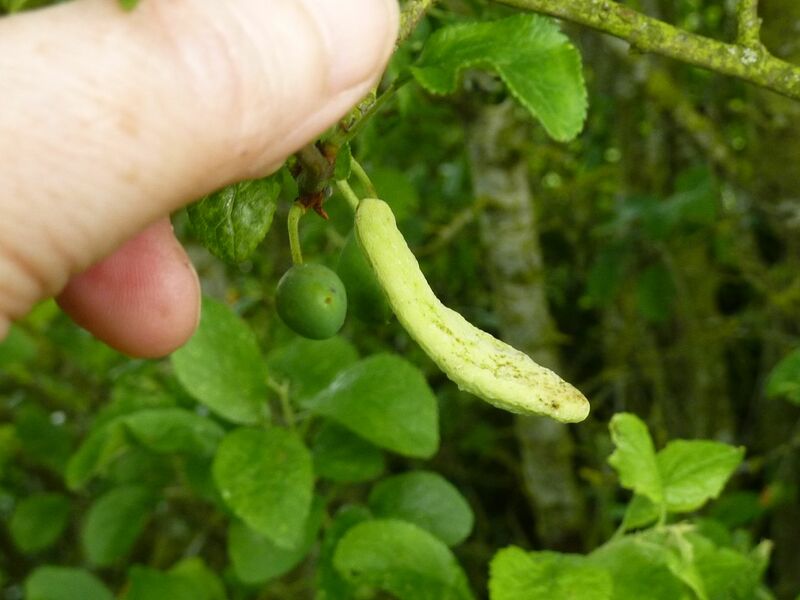 When I spotted the arrival of pocket plum this year I took some photos to record how the natural history of this disease evolves. What Does Pocket Plum Look Like? 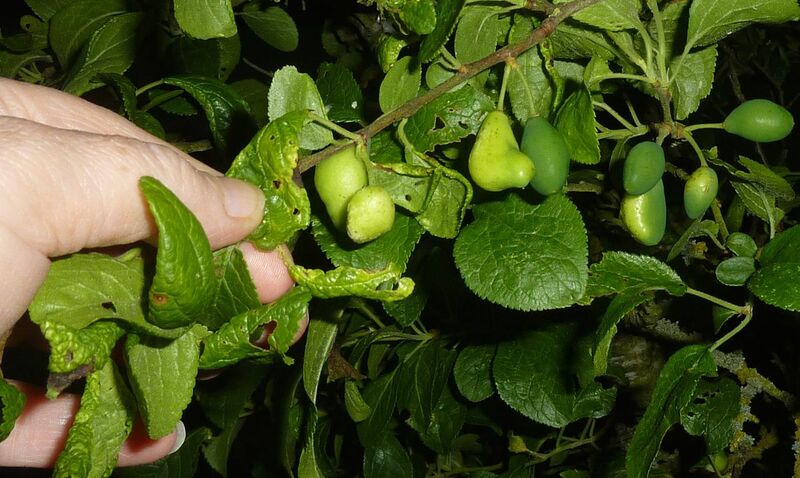 Most commonly, the signs of pocket plum are seen on the fruitlets. 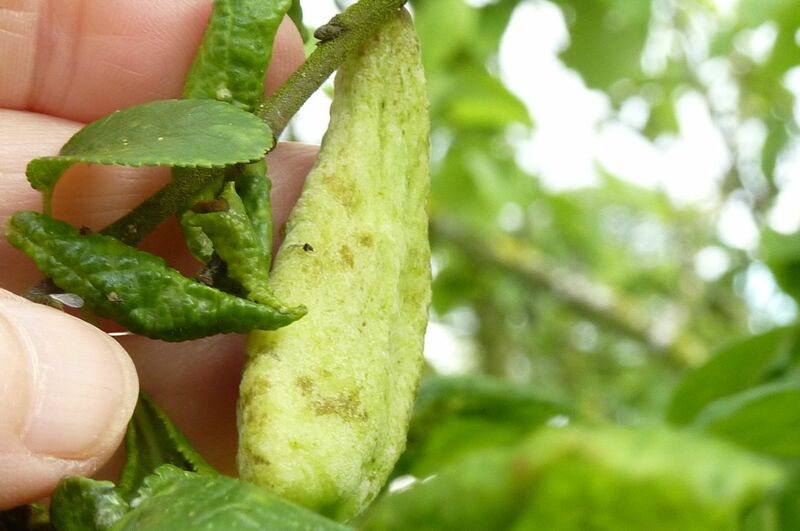 The first sign of infection is small spots on the fruitlet. The first sign that something is amiss: the small, apparently innocuous spots of pocket plum on damson fruitlets. Next, these spots develop into small white blisters. Pocket plum blisters have appeared. Now, the infamous deformity caused by pocket plum is also becoming apparent. Also, notice how neighbouring damsons are healthy and normal in size, shape and colour. 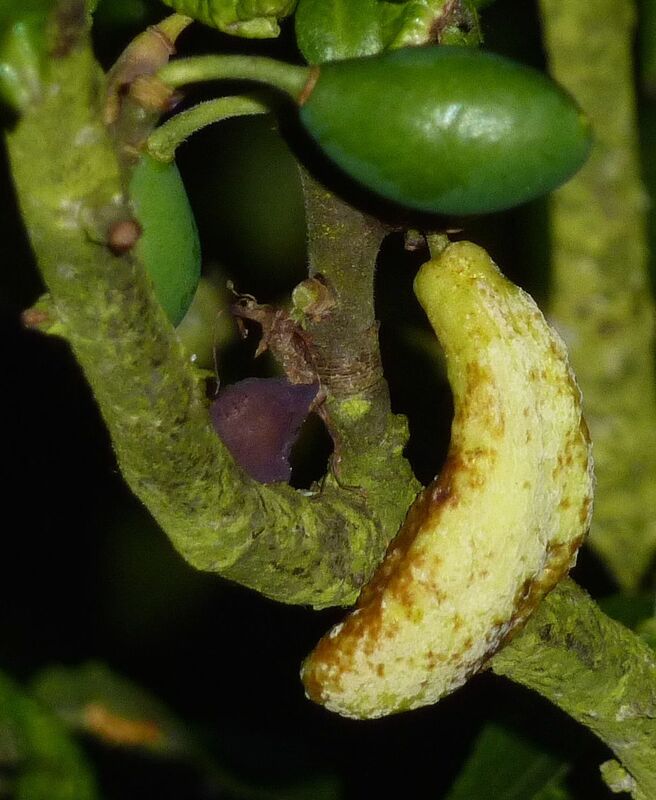 The small blister-like spots of pocket plum in association with deformity of the fruit. Next, a white spore layer forms on the surface of the fruitlet. When you squeeze the flesh of the damson it feels unappetisingly spongy. The white spore layer of pocket plum on an infected damson fruitlet. One of the features of pocket plum disease is that it there is no stone inside the fruit: it’s just a cavity. Another feature is that the diseased fruitlet grows at an alarming rate. It’s as if the division stage of the cell cycle is out of control. Elongation is the name of the game. A pocket plum-infected damson that is several times its normal size. 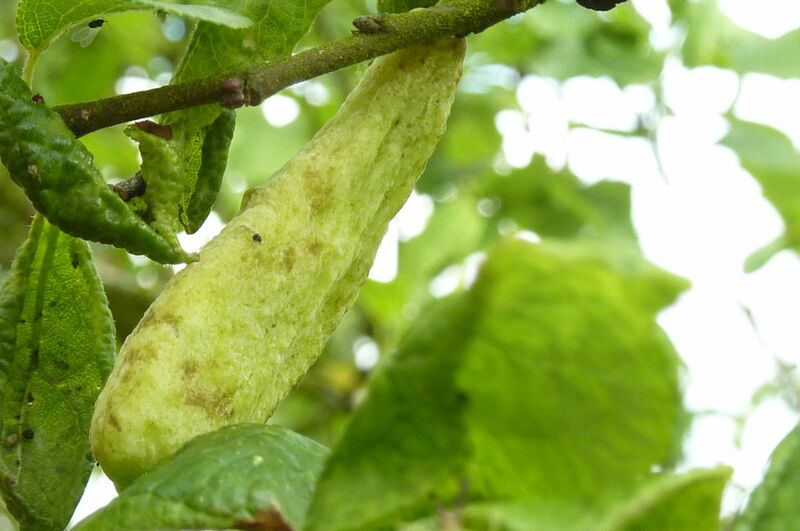 Next, the diseased fruitlet starts to turn brown. Folds and fissures also deepen. Brown patches start to appear on the infected fruit. Here you can see how much bigger the infected damson is compared with a typical healthy damson. Notice, too, how flat it is; inside is just a hollow with no nutritious fruit flesh. The infected damson curls into the shape of a small banana. Hence the name “bent banana disease”. The brown plaques become more extensive. The diseased damson gradually turns brown and then grey and dries out. Eventually, this diseased damson will fall off the tree. 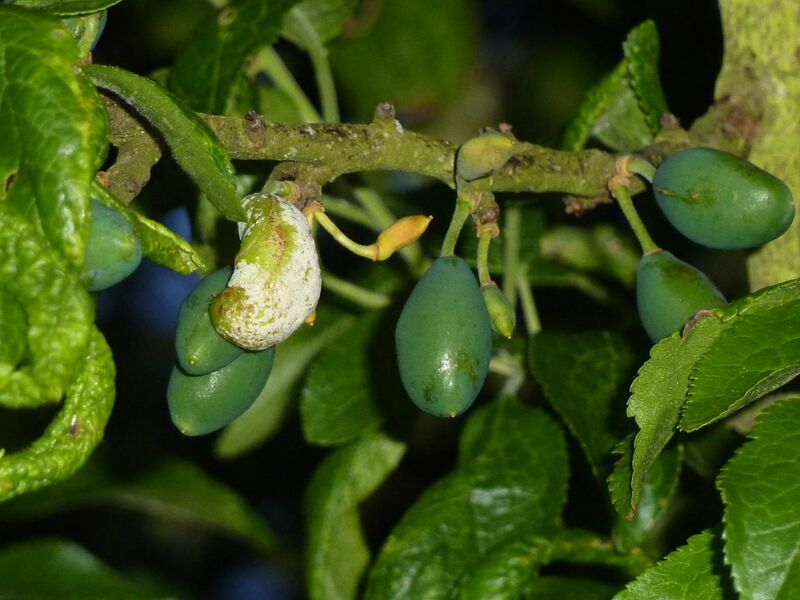 What Should You do if Your Damson Tree Develops Pocket Plum? 1. Removed diseased fruits promptly and burn them. 2. Cut off any diseased twigs and burn them. 3. Check for diseased decaying matter under the tree and burn it. You could spray with Bordeaux mixture in early Spring, but this is not deemed effective. The key message is not to panic if you spot pocket plum on your damson tree. Your tree won’t die and it will continue to produce fruit. Have you ever spotted pocket plum on your damsons? If so, what effect did have on your crop and how did you deal with it?